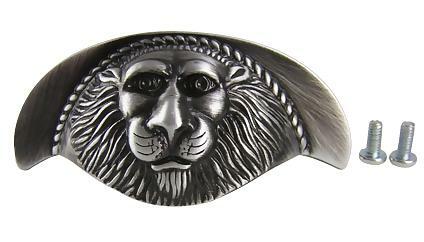 3 1/2 Inch Roman Lion Solid Brass Cup Pull (Antique Pewter Finish) - This cup pull measures 3 1/2 inches long by 1 3/4 inches tall with a 1 3/8 projection and 3 inch mounting distance. It is constructed with solid brass by Century Hardware and comes complete with mounting hardware. Available finishes include Antique Pewter (shown), Oil Rubbed Bronze, Polished Brass, Matte Satin Nickel and Antique Brass.